In the last post I blogged about La baule beach. 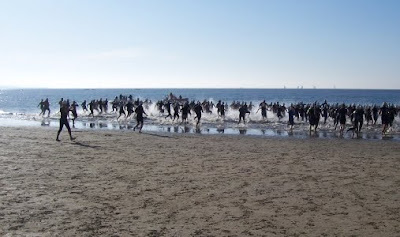 This week-end it was the famous triathlon race in the atlantic seacoast city. At Obeo we try to participate each year to the tri relay. Tri relay distance is quite similar to a triathlon Sprint distance, but each sport event (swimming, cycling, and running) is performed by a different person. This year Ed participated with us. He took the opportunity to be in Nantes to went for a fresh swim early in the morning. During the race, Freddy, Goulwen, Laurent, Nathalie, Stéphane and others cheer for us. Despite of these many supporters, I did not beat a time, to be honest I was one of the slower cyclist. However the tri relay was not the significant competition, the football match on the sand after it was the real one ! After one hour and half we grab a victory and Nathalie was the key of our success ! In the evening we were very well received by Cédric, with a giant and delectable barbecue. Friday and today I worked on GEF Support for SWTBot. If you follow bug 269609, you should have seen that Initial code contribution was committed, and that I am currently working on SWTBot build to include the GEF feature. Nathalie tested and provided patches on first versions, so many thanks to her on this side too.